PRIMM, NV – If you’ve ever driven through the desert from the Los Angeles area to Las Vegas, you know it’s one of the most rugged, desolate places in the United States. Whereas many deserts in the southwest have some beautiful and distinctive vegetation and land features, the California/Nevada desert is bleak. That’s not to say it isn’t fun to visit, especially when some of man’s creations are thrown in. One case in point is Primm Valley Casino Resorts, which straddles the two-state border and is always a welcome site for those heading for the multitude of entertainment pleasures that southern Nevada represents. The par five 2nd hole reveals the first sizeable lake, which comes into play on all three shots. Primm Valley is about 45 minutes from the Las Vegas “strip” (off of I-15) and deserves a look for those who might be seeking a Vegas-like experience without the crowds, expense and sometimes overdone decadence of the bigger city. 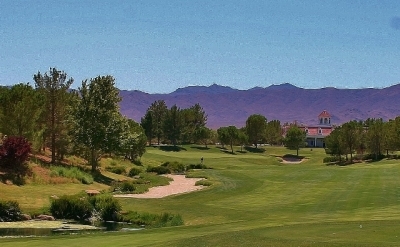 And making Primm Valley even more attractive are its two Tom Fazio-designed golf courses. The Lakes Course (which we played on our visit) opened in February, 1997 and offers a very un-desert-like golf experience. Groves of pine trees separate the holes and the layout’s lakes and streams (which come into play on 11 holes) provide an escape that you won’t find just anywhere in the region. 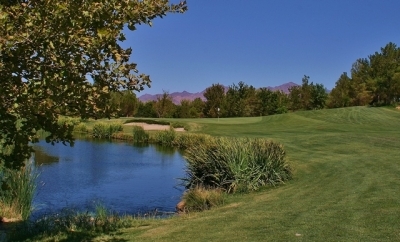 Unlike its Primm sibling, the Lakes Course has an abundance of turf, making it very friendly to the high-handicapper. The Lakes’ main challenge lies in avoiding large and sometimes deep greenside bunkers – and of course, staying out of the water hazards. The putting surfaces are also fairly undulating, adding more difficulty and interest for better players. 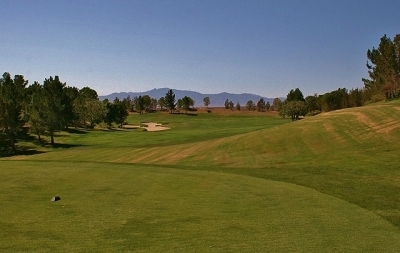 In contrast, the slightly younger Desert Course (which opened in May of 1998) was built to emphasize desert landscaping – even if the flora wouldn’t be native to this particular desert. 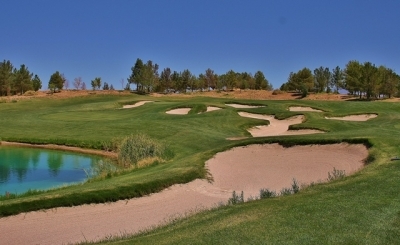 Slightly longer than the Lakes, the Desert Course is more typical of a target-type layout, weaving in and around a desert environment with palm and mesquite trees, as well as colorful cactus and desert wildflowers. The 450-yard, par four 15th hole gives you plenty of room to drive the ball, but you still must challenge the hazards to make a good score. As Tom Fazio explains below, the Desert Course was specifically meant to save on water – so expect to see more sand features (such as waste bunkers on seven holes). 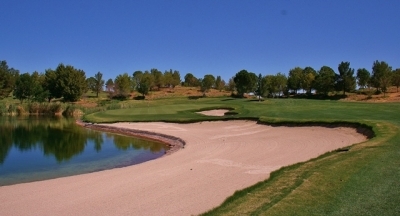 There is some water on the course (on five holes), but the Desert’s primary defenses include narrow fairways with elevation changes and large, well-bunkered greens. 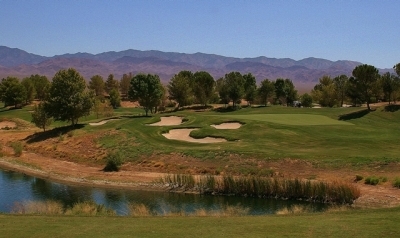 GolfTheUnitedStates.com: When you first went to Primm Valley, which I assume was just basically desert without a lot of features, what were your first impressions? Tom Fazio: The factors at Primm Valley related to water. Whenever you go to that type of environment, you first ask, what kind of water do you have? 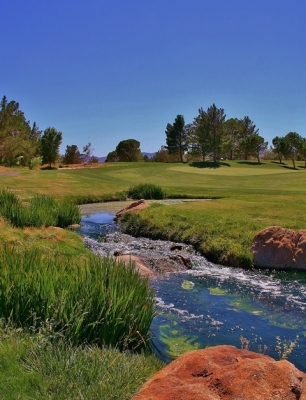 Primm happens to have an aquifer which would allow them to produce golf. That’s the first question – is there enough moisture in the ground where you can do that. 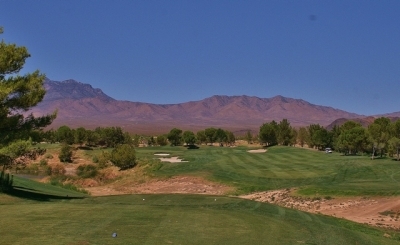 The view from the tee of the par four 5th hole is a good example of the seclusion you feel at Primm Valley. In that particular case, in that location, I also inquired about the financial feasibility of it. Who’s going to come there and why? Well, first of all, the majority of people who come to Las Vegas drive, and they drive from Southern California. Primm Valley is on the main track, and there are three hotels there as you cross the state line. That’s why they happen to be there. The golf courses are actually on the California side. GolfTheUnitedStates.com: So the project was feasible. How did you come up with two distinctly different golf courses? This pond on the left side of the short par four 14th hole forces you to be accurate off the tee. Tom Fazio: Well, obviously you’re going to need some kind of turf for a golf course, but we knew it would have to be a limited amount at Primm Valley. Water is of the highest priority, the #1 commodity. So you start balancing how many acres of grass are feasible and practical, and logical… What we did was, instead of having an equal amount on both golf courses, we decided to put more turf on one than the other – hence, it allowed us to create two golf courses with different styles. Both golf courses together utilize about the same minimal number that’s necessary for golf in terms of gallons used. But we put more grass on the first golf course and then created more of a desert course for the second golf course. Hence, we created two different styles. On the Lakes course, you have a series of bodies of water that are mainly storage lakes that kind of recycle water. And even though it is desert, you can get some help from the sewage treatment plant facilities that are there in Primm, Nevada. That’s how we created the style and the setting for two different styles of golf that are very distinctive and very different from each other. Right from the start, you will see there is plenty of room to drive the ball at Primm Valley. Here, the 1st hole. GolfTheUnitedStates.com: Were you able to use any runoff from the mountains when it does rain? Tom Fazio: Yes. There are underground drainage capture areas that drain and collect water and send it in to the storage areas. But runoff is a minimal amount there. It happens occasionally, but they don’t get the summer afternoon thunderstorms as compared to someplace like the Phoenix area. GolfTheUnitedStates.com: Now when you have a basically flat desert environment like at Primm, is it more challenging to plot out golf holes? Tom Fazio: Honestly, no, it’s not more challenging, it’s just different. Water flows freely on the Lakes Course. First of all, what appears to be flat when you go into those environments – the desert floors of big canyon areas, big earthen slopes and locations -- it isn’t necessarily flat. It looks flat, but there happens to be pitch, slope in the land. That little bit of slope is enough to work with in that it allows you to change elevations. And by the very minimal amount of cut and fill – cut two feet in one location, and you pick up that two feet of dirt and try to pile it on one side of a golf hole. So now you have a four foot separation of elevation change. You’ve doubled it from your initial situation. The earthwork operation becomes very simple, easy and inexpensive – probably the least costly thing to do on any project is move the earth, because it’s only a one-time deal. And for that one time deal, you create an environment, you create a setting, you create a character, you create interest and uniqueness in the land. So even though sometimes earthwork gets discussed as a potential negative – that’s when people think you have a better situation if you have natural rolling terrain. Missing long is better than short on the par three 9th hole. Well, that’s somewhat true, in one sense, but if you don’t have natural rolling terrain, then moving the earth is a very simple solution -- except if it’s rock. But if you have sandy soil, or easy dirt to move, where the median is, it’s not difficult, it just might take more imagination and it just becomes part of the process. 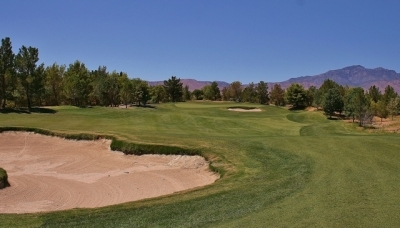 GolfTheUnitedStates.com: When you go into a place like Primm Valley, do you make an effort to preserve the native vegetation in the area, or do you bring in your own landscaping? Tom Fazio: In harsh desert settings like southern Nevada, there’s almost no vegetation that is preserved. That’s true unless you get in any type of an environment where you get some moisture through unique situations, but without moisture, there’s no vegetation. Now, in some desert areas of southern Arizona, in the foothills or mountain areas, especially – and there are some areas of Nevada where you have some moisture – but in many cases, there’s no vegetation, so there’s nothing to save. You may find some cactus, like in southern Arizona you find the Saguaro, and you save every one of them. The par four 10th hole is a good example of how a little elevation variation can make a big difference. You pick ‘em up and you move them. You take the native vegetation and you replant it. But in the southern Nevada desert areas, in a case like Primm Valley, there’s no vegetation -- which makes it easy to start with. Because there’s nothing to save. GolfTheUnitedStates.com: In constructing a desert course and management of things like runoff and dust, is that a concern? Tom Fazio: Well, dust is a concern during construction, certainly, during the windy season, but again, that’s handled through the construction process. The large sloped green protects par on the par three 6th hole. First of all, when you move the earth, you have to wet it – so you have to put water on the dirt as you move it in order to compact it. Without any moisture in the ground, the soil would not be firm and would settle over time. So you have water trucks and as you move earth, you water the dirt. You roll it and compact it so you’re creating natural compaction. And as you’re watering the dirt to compact it, it also keeps the dust down. Certainly dust is an issue. You can get a springtime windy season and the dust element is an issue, but it’s dealt with by water trucks. And that’s just part of the construction process. 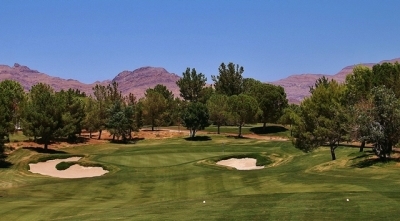 GolfTheUnitedStates.com: Does the wind in a place like Primm Valley factor into your design as well? Avoid this bunker in the middle of the tee shot landing area on the long par four 8th hole. Tom Fazio: The wind does factor in, relative to playability. In that particular area in southern Nevada, it has windy seasons where certain times of the year it’s another hidden hazard. The wind is out there, and it’s the mystery man of the night -- you don’t know when it’s going to show up. Wind and prevailing breezes in that area – it’s pretty constant. And in some of those places, you go from a December/January – a 90-day window where you could have some cold temperatures. You could have strong wind and cold, so you have to factor that in as well. Favor the left side off the tee on the long and challenging par four 18th hole. GolfTheUnitedStates.com: Right. Is there anything else that stands out about Primm Valley? Tom Fazio: What I always found about Primm Valley was that people were so amazed at the uniqueness of two different golf courses that are on the same piece of property. That, and having two different quality golf experiences that seem so remote. It was a shock to people when they get there, what a pleasant experience. Add the fact that its location is so remote, it means the price of land wasn’t as high. And the price of the whole operation allows them to sell that experience at a very competitive price range, so people felt there could be great value. It adds to the enjoyment. 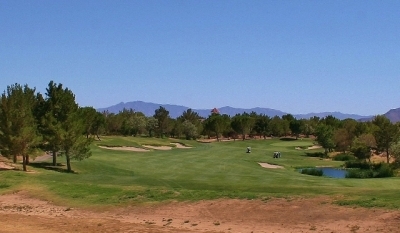 Fazio touched on the remoteness of the site – which is definitely the case – but Primm Valley also offers two core golf course experiences with no houses or condos bordering the playing areas. The mounding and trees on the Lakes Course also effectively hide other holes – so there’s a real sense of privacy as well. Add the beautiful long-range mountain views, and you have something that’s pretty special. Consult the website for the latest rates and specials. As you would expect, there are a number of attractive packages with a hotel stay, and Primm Valley is close enough to Las Vegas to take advantage of the multitude of offerings there. Note: Juniors play free with a paying adult.